Sushiiiii ! Its been quite sometime since i had sushi . Went to Sushi Zanmai in the Gardens with Zhi Lin yesterday . 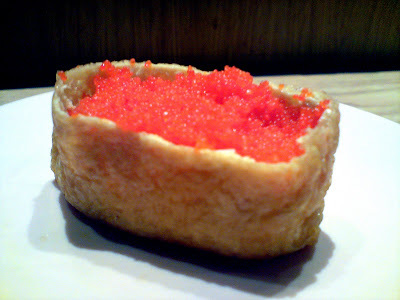 Why sushi zanmai ? Because everybody said it was better than Sushi King . And yup , it was Gooooood . I would definitely go for a second round . 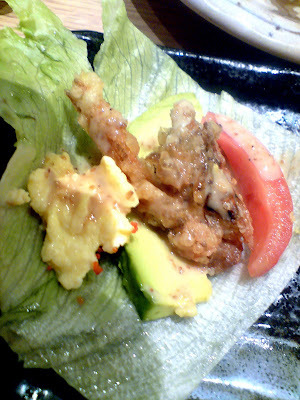 Soft shell crab was on promotion . We ordered their Soft Shell crab Salad . And also their soft shells crab sushi rolled in caviar . Both were delicious . Cukup taste . Cukup special . Ordered their teriyaki grilled salmon too . This one , so so only . The sushi on the belt were quite good too . Each sushi offered something different . 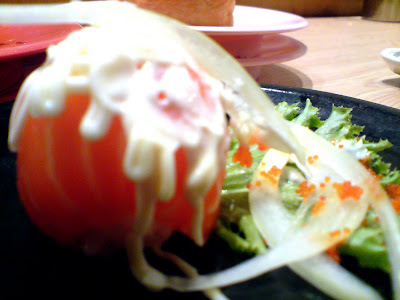 If compared between sushi zanmai and sushi king , I would say Sushi Zanmai wins in terms of variety and quality of food . As for the price . I'm not too sure . Some said that Sushi Zanmai was cheaper . The cheapest plate of sushi on the belt was for RM 1.80 and our soft shell crab sushi was RM 6 for 6 of it . Our bill came up to RM 34 per person . RM 34 for a plate of Teriyaki salmon . 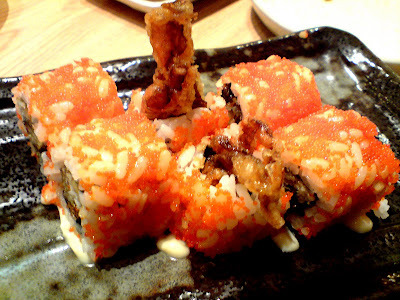 3 Soft shell crab sushi . Soft shell crab salad . 6 plates of sushi from the belt which cost average RM 5 per plate . RM 34 for a full tummy , quality food , variety and good service . I give it double thumbs up !